The Cosgrave Legacy, Stephen Collins, Dublin, 1996. Judging W.T. Cosgrave by Michael Laffan, 2014. See RIA and book launch. W. T. Cosgrave Papers at [RIA]. Catalogued as P285 at [UCD Archives]. Obituary of W.T. Cosgrave, The Times, 17 Nov 1965. The Irish Counter-Revolution: Treatyite Politics and Settlement in Independent Ireland, 1921-36, John M.L. Regan, 2000. 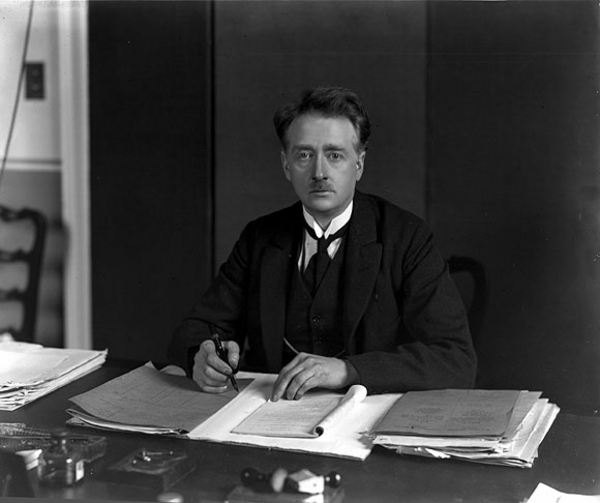 WT Cosgrave, 1880-1965: Founder Of Modern Ireland, by Anthony J Jordan, 2006. See here. first prime minister of Ireland ("President"), 1922-32. William Thomas, Willie, born 6th June 1880, Dublin. He was educ Christian Bros school, Malahide Rd, Marino (now Dublin Fire Brigade Training Centre). He worked in family pub at 174 James's St, Dublin. See him at home in 1901 census. W.T. attended first Sinn Fein convention 1905. Sinn Fein councillor on Dublin Corporation from 1909 through most of the period to 1922. Councillor for Usher's Quay ward (along with Michael Flanagan, whose daughter he would marry). See him at home in 1911 census (return in Irish, he is "Liam T. Ua Cosgair"). He joined Irish Volunteers 1913. Fought in 1916 Rising under Eamonn Ceannt at the South Dublin Union. His step-brother was killed. Afterwards he was sentenced to death. Commuted to penal servitude for life. Interned in Frongoch, Wales. Released under general amnesty Jan 1917. He was elected as Sinn Fein MP for Kilkenny city in by-election, 10 Aug 1917. A poster says: "VOTE FOR COSGRAVE - A FELON OF OUR LAND". Elected TD for Sinn Fein in Dec 1918 general election in Kilkenny North, unopposed. James O'Mara won in Kilkenny South. Treasurer of Sinn Fein. Imprisoned again. Member of the First Dail. Could not attend first meeting in Jan 1919 because he was in prison. In the rollcall at the Dail's first meeting on 21 Jan 1919, "Liam Mac Cosgair" is absent, described as "fé ghlas ag Gallaibh" ("imprisoned by the foreign enemy"). He was released in 1919. During the War of Independence 1919-21, W.T. was Minister for Local Government 1919-21 in the underground government, with the job of organising non-cooperation with the British authorities and establishing an alternative system. He mar June 1919 to Louisa Flanagan [born 28th Aug 1882]. 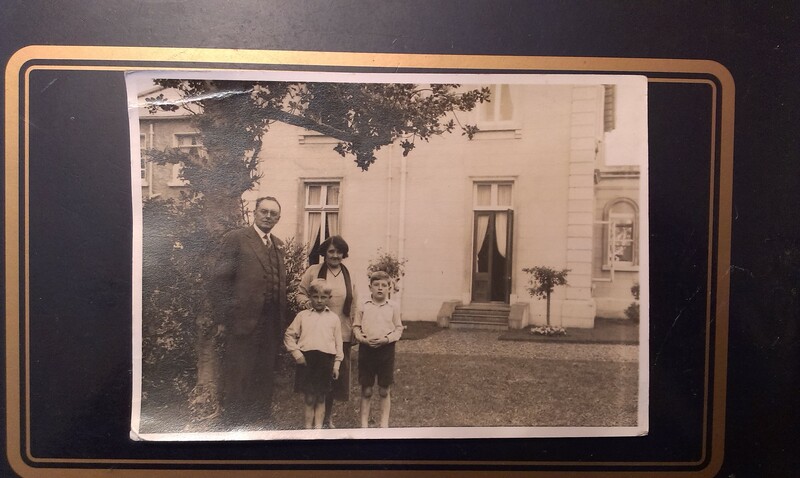 He moved 1919 to Beechpark, Templeogue, Co.Dublin. Beechpark was a wedding gift to Louisa from her father. Although on the run, W.T. did much to undermine the existing institutions of local government, particularly after Sinn Fein swept the 1920 council elections. Became an Alderman on Dublin Corporation after the Jan 1920 local election. He supported the Anglo-Irish Treaty, Dec 1921. Louisa appears in a story in [Ward, 1983]. There was a plan by Cumann na mBan members to protest the Treaty by raising the Union Jack over the building housing the Treaty debates to denote the betrayal that was taking place. They went to large shops looking for a Union Jack, "But Mrs. Cosgrave .. happened to be in the exclusive shop of Switzers" [on Grafton St] "and was told of what was happening. She of course immediately reported the plot." The Treaty was passed Jan 1922. The nationalists split. W.T. was re-elected TD for (pro-Treaty) Sinn Fein, Carlow-Kilkenny, general election, mid-June 1922. Civil War started end-June 1922. After the deaths of both Arthur Griffith and Michael Collins in Aug 1922, W.T. became head of the pro-Treaty side. When the constitution of the Irish Free State was enacted Oct 1922, he became "President of the Executive Council" or head of government. He was the first prime minister of Ireland ("President of the Executive Council"), 1922-32, covering the governments of 1922-23 and 1923-27 and 1927 and 1927-32. He was Minister for Finance 1922-23. The executions: During the Civil War of 1922-23, he and his Free State government took a ruthless stand against the anti-Treaty forces. His government executed 77 republican prisoners in Nov 1922 - May 1923, far more than the British executed in the War of Independence. Anyone bearing arms on the anti-Treaty side was liable for a military trial and execution. Those executed included Erskine Childers, hero of the Howth gun-running, and (without trial) Liam Mellowes and Rory O'Connor (ignoring even the pleas of the Archbishop of Dublin, who spent hours with W.T., trying to persuade him to stop the executions). W.T. 's house Beechpark was attacked and burnt down by the anti-Treaty side in Jan 1923. The pro-treaty government party was re-named Cumann na nGaedheal Apr 1923. W.T. 's government won, the anti-Treaty side gave up, and the Civil War ended May 1923. W.T. was Cumann na nGaedheal / Fine Gael TD 1923-44. He was re-elected TD for Carlow-Kilkenny, general election, Aug 1923, for Cumann na nGaedheal. He was Minister for Defence 1924. He dealt with threatened mutiny 1924 by some old IRA officers in Free State Army, who planned to force the government to establish a Republic. The officers backed down. Knight of the Grand Cross of the Order of Pius IX, 1925. Friend of Frank Duff and supporter of Legion of Mary (founded by Frank Duff 1921). TD for Carlow-Kilkenny until 1927. TD for Cork city 1927-44. 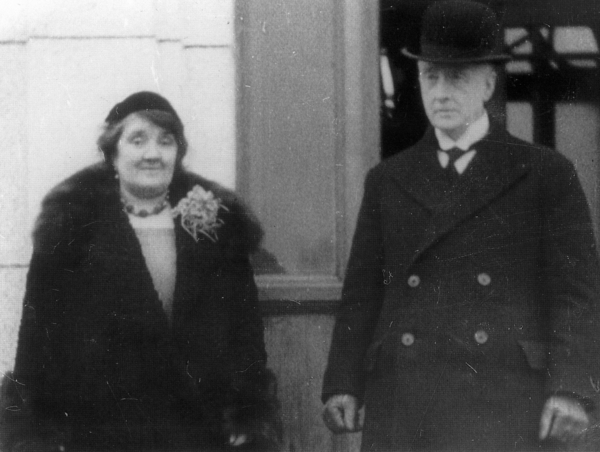 He made the first Irish state visit to America in 1928. He was asked in 1930 by the co-founder of the Irish Labour Party, William O'Brien, to grant asylum to Leon Trotsky, widely regarded as a mass murderer. Cosgrave refused. Not everyone will agree on W.T. 's legacy (or the legacy of any political figure), but here are the general arguments made for and against. As head of the Free State government in the Civil War, he was ruthless in what he saw as defense of the state against his former republican comrades. By many he was never forgiven for the execution without trial of republican prisoners. The hard line on law and order and against republicans continued after the Civil War ended May 1923. He founded a real democracy. Violent revolutions normally lead to some new form of tyranny. Not in Ireland's case. W.T. founded a true parliamentary democracy, avoiding the dangers of military rule, fascism, communism, corruption or anything other than normal parliamentary democracy. In the darkest days of WW2, Ireland was one of only a handful of democracies left in the world. Today, only about 10 countries out of 200 in the world have been democracies as long as Ireland. He gave up power when he lost the election. In this view, Ireland was truly defined as a democracy in 1932. 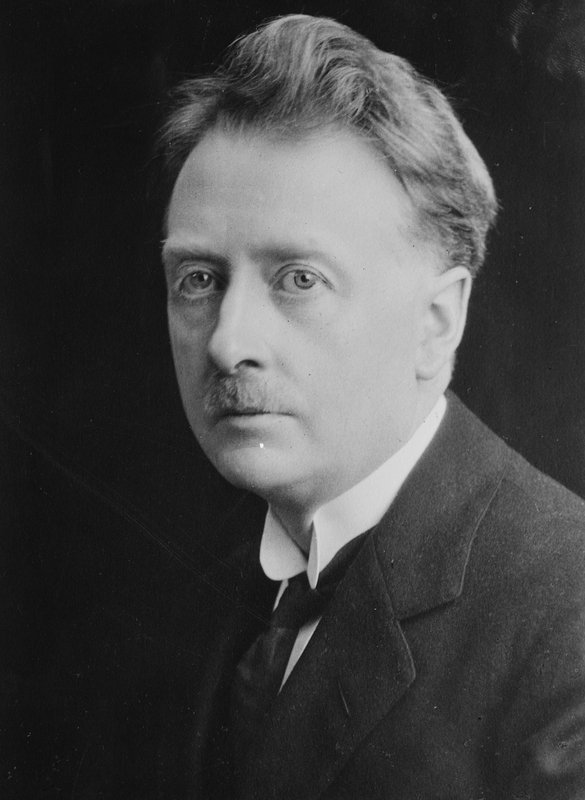 When the republicans, who only a couple of years before had opposed the very existence of the state with violence, finally won a fair election, Cosgrave did, like a true democrat, peacefully surrender power - even though many Free Staters at the time were strongly opposed to surrendering power to de Valera. He founded a real independent country. Despite the fears about what the Treaty meant at the time, under Cosgrave the Treaty really did mean effective independence for southern Ireland. As [Wallace, 1983] puts it: "by the time he was defeated by Eamon de Valera in the 1932 election, he had established a secure parliamentary democracy and had achieved in dominion status a cordial and almost complete independence from the UK". He was more modern than de Valera. In its ethos, his state was more modern and inclusive than the more narrow Catholic state later established by de Valera. He appointed a broad range of scholars and Anglo-Irish to the Senate. The 1922 Constitution was reasonably secular and tolerant (later replaced by de Valera's more Catholic, sectarian, 1937 Constitution). In economics he was interested in prosperity while de Valera was interested in revenge and ideology. The self-destructive Economic War with the UK would not have happened under Cosgrave's government. His party lost power to the formerly anti-Treaty side Fianna Fail in general election Feb 1932. He led Cumann na nGaedheal in opposition after 1932. The Blueshirts: Both sides flirted with non-democracy in 1932-34. On the anti-Treaty side, now that Fianna Fail were in power, the IRA began to disrupt meetings of any opposition, with apparent government approval. On the pro-Treaty side, Cumann na nGaedheal had links with the Army Comrades Association (the Blueshirts), which was formed Feb 1932 as an anti-IRA, anti-communist group to protect the opposition. The Blueshirts adopted symbols of then-fashionable European fascism. They were not a serious fascist movement (with racial beliefs etc.) though membership was restricted to Christians, and they did express support for aspects of European fascism. Blueshirts re-named the National Guard, July 1933. Cumann na nGaedheal was re-named Fine Gael after merger with Blueshirts Sept 1933. But Fine Gael was dominated by the normal democratic party Cumann na nGaedheal, and the Blueshirts were finished by the end of 1934. W.T. did support Franco in the Spanish Civil War 1936-39, as did the remnant Blueshirts. For W.T. (and other Catholic democrats in Ireland who supported Franco) this was about supporting the Catholic church against communists who were burning churches and killing thousands of clergy, rather than about supporting non-democracy per se. Opponents of Fine Gael still link them to the Blueshirts and fascism. However the people in Ireland who actually supported Nazi Germany in WW2 were the IRA. W.T. was opposition leader until he resigned from the Dail, Jan 1944. He was member of Irish Racing Board 1945, chairman for many years. Louisa died 16th June 1959, Beechpark, age 76 yrs [GROI]. She was bur Cosgrave family grave, Goldenbridge cemetery, Inchicore, Co.Dublin. W.T. died at Beechpark, Tue 16th Nov 1965, Dublin, age 85 yrs. State funeral, Thur 18th Nov, bur Goldenbridge cemetery, see photo at funeral. The President Eamon de Valera and the Taoiseach Sean Lemass attended. See funeral reports in Irish Press, 19 Nov, and Irish Independent, 19 Nov.
See biography and images and election record. "Goban" after W.T. 's step-brother Frank "Goban" Burke, who was killed in the 1916 Rising. From United States Library of Congress. 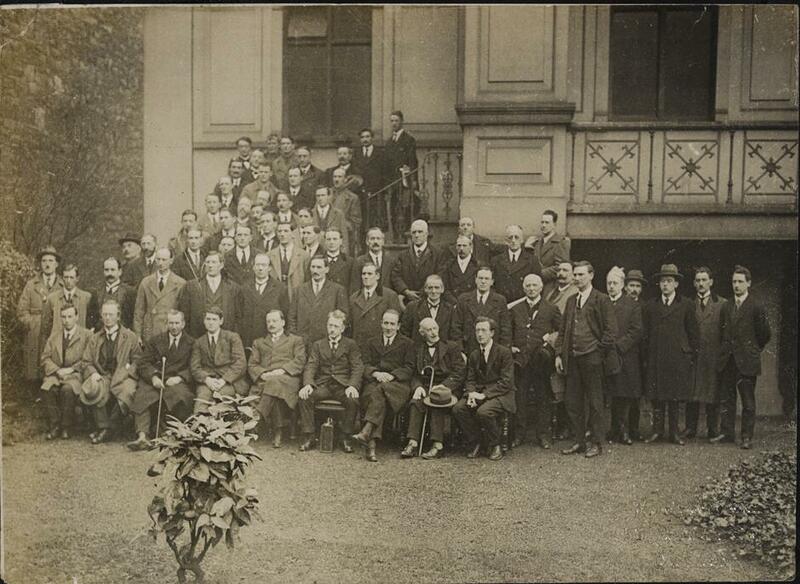 The pro-Treaty group, outside the Mansion House, Dublin, in 1922. Front row includes a line of Michael Collins, Arthur Griffith, W.T. Cosgrave, Kevin O'Higgins. This is after the split of Jan 1922 and before Aug 1922 (when Griffith and Collins died). Louisa Flanagan and her sons Liam and Míceál, and unknown person, Beechpark. W.T. Cosgrave pledges money to Michael Collins (centre), Minister for Finance of the underground Irish Republic. This is a clip from the Republican Loan film, a fund-raising film shot at St Enda's, Dublin, in 1919. Movie is here on my YouTube account. President W.T. Cosgrave at Limerick's Civic Carnival, 1931. Featuring W.T. and his wife Louisa Flanagan. Louisa Flanagan and W.T. 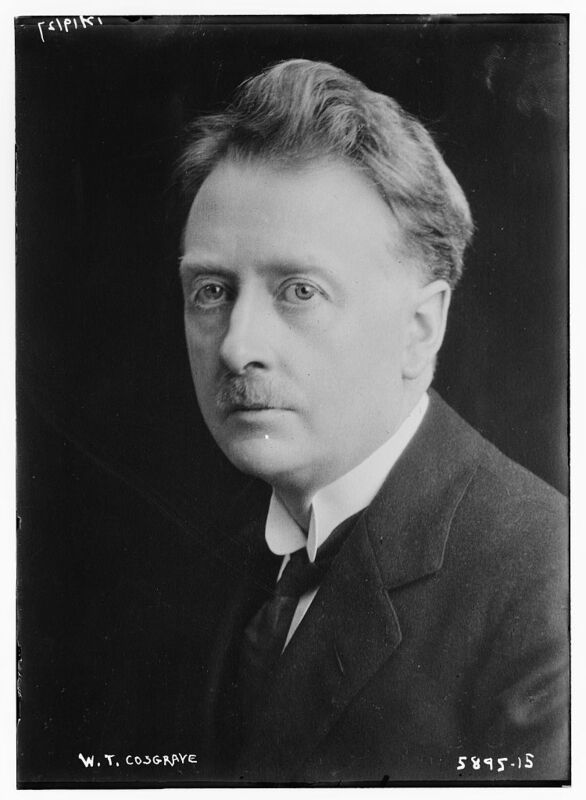 Cosgrave. Scene shown in above video. During 1933 general election. Featuring W.T. addressing huge crowd at College Green, Dublin. "President" meant head of government, prime minister. Head of state supposedly rested with the Governor General / The Crown. "Taoiseach" means head of government, prime minister. "President" means a separate head of state, with very few powers. The Fine Gael TD John A. Costello made a controversial speech about the Blueshirts and fascism in the Dail on 28 Feb 1934, that is sometimes mistakenly attributed to W.T. Cosgrave. Na Taoisigh: Leaders of the State, RTE Radio 1, 2001. Seven Ages, history of the Irish state, RTE TV, 2000. Part 1 - The First Decade has video footage of W.T. 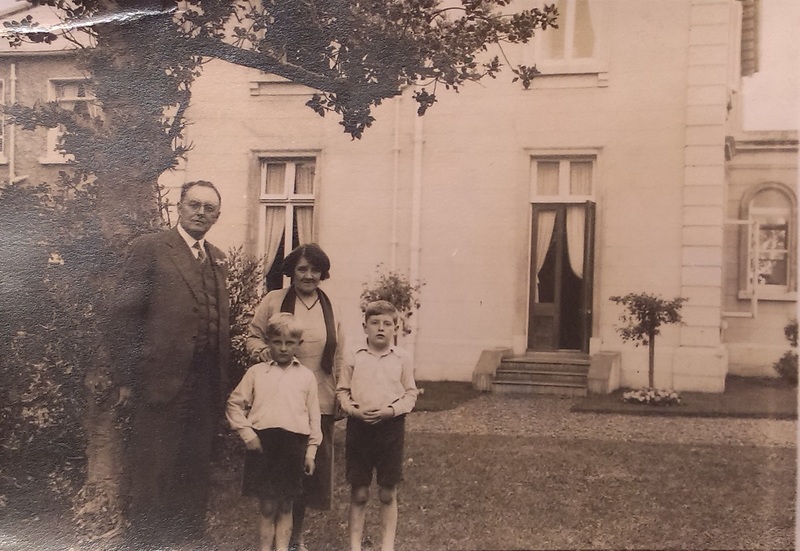 and family at Beechpark in the 1920s. The series also has interview with Liam Cosgrave (presumably in Part 6 - The Seventies, and maybe other parts).